Good afternoon! I wanted to share this little card with you I made for Mojo Monday's sketch #124, and the Softpencil challenge #17 (use bling or brads or both). Be sure to stop back later - I have some more creations I will be sharing! Image is from Softpencil, colored in with Bic Mark Its and Copics. Brads are Doodlebug. 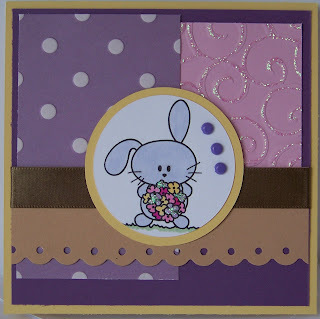 I also used stickles and a Fiskars border punch. Paper is SU Creamy Caramel, So Saffron, Mauve Mist and Lovely Lilac. DP is DCWV and ribbon is from my stash. I just love that image, you colored it beautifully! I love all the layers on this one...great colors too!